MAS Press Knife and Die Company Ltd was founded in 1966 by Arthur Handford, Stanley Gammage and Maurice Corrall. Initially operating from small premises in Leicester, we supplied press knives and dies almost exclusively to the Leicestershire shoe industry. 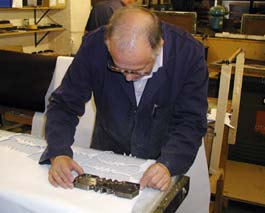 After moving to larger premises the founders retired in 1989 and operations continued under the direction of Michael Handford and Dave Burdett. In 1977 we were joined by Steve Edge and shortly after, moved to our present site on Beatrice Road. Since the decline in the local shoe industry, we have diversified to supply press knives and dies to a wide variety of trades such as plastics, leather goods, the motor industry, toy manufacturers, plastics, leather goods, arts and crafts, the film industry etc. but still supply many U.K. footwear manufacturers. We also offer a cutting and pattern grading service. We supply nationwide as well as locally and currently all work is undertaken by ourselves and a small specialised workforce with no member of staff having less than 40 yrs industry experience.